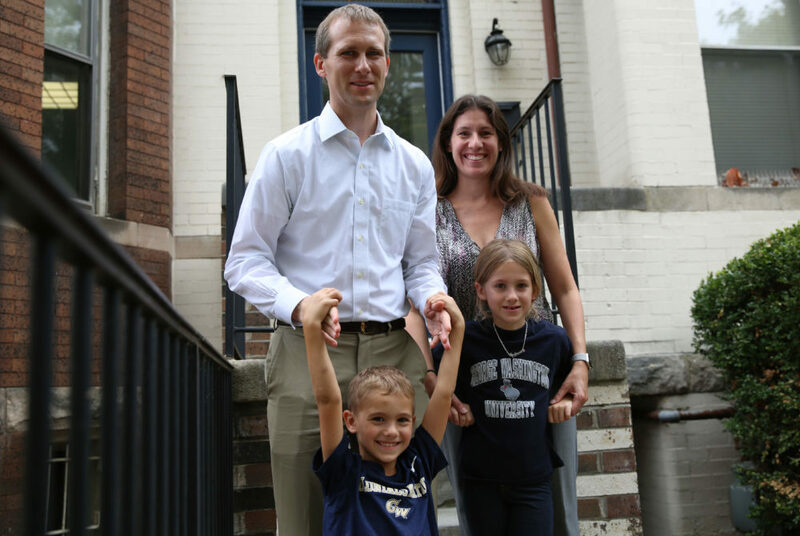 Stewart Robinette, the assistant dean of residential engagement, lives in a townhouse on 21st Street with his wife, Laura, and two kids – Charlotte, 6, and Arthur, 5. Aside from this weekend, students are likely far from their families during the academic year. Despite living far from home, most students forget that they’re surrounded by families in Foggy Bottom. It’s not just undergraduates and young professionals living on and around campus. The outskirts of the Foggy Bottom Campus are dotted with townhouses holding some families who have no connection to GW, and many faculty members and employees of the University live in residence halls and houses on campus. Stewart Robinette, the assistant dean of residential engagement, lives in a townhouse on 21st Street with his wife, Laura, and two kids – Charlotte, 6, and Arthur, 5. The family has been living on campus since last year, and Robinette said his kids love having college students as neighbors. Robinette said he brings his family to GW programs – such as the Vern Harvest and Fountain Day, a pre-summer festival on the Mount Vernon Campus – and that he also occasionally has resident advisors over to his townhouse. When they first moved into their home, Robinette said he and his family brought homemade cookies to their neighbors – members of the Lambda Chi fraternity. Robinette said he has “shared expectations” about noise with the fraternity. “These are some of the best neighbors we’ve had anywhere,” Laura Robinette said. Kate Malcuit, who has been living in a townhouse behind the Foggy Bottom Metro stop with her family since 2011, said she wishes she had more interactions with the GW community – or at least had some college students to babysit her 1- and 3-year-old sons. The mother of two said when she and her husband moved to the neighborhood about six years ago, they were almost entirely surrounded by students. Since then, the neighborhood changed from housing undergraduate students to older graduate students and professionals. Malcuit said the cultural experience of living near a campus was “very important” because of the access to events and prominent speakers, but she wishes information about concerts and basketball games were more easily available for those that aren’t students and faculty. The brick and concrete construction of their townhouse makes for solid sound barriers from their next door neighbors, which have frequently changed over the years, she said. Through the Faculty in Residence program, professors and administrators live among students in residence halls. Toni Marsh, the faculty in residence for Amsterdam Hall and faculty guide for 1959 E St., found a way to connect with students through her popular bagel Thursdays. Every Thursday, anywhere from 40 to 80 students will stop by her room from 8 to 10 a.m. for bagels, muffins and coffee, she said. During these informal morning get-togethers, conversations turn into “wide ranging and fascinating discussions” about politics, art and travel, Marsh said. When she missed a bagel Thursday to attend a conference in September, her students held one of their own, meeting in a student’s room and substituting baked goods for their regular bowls of cereal. Marsh, who is an associate professor and the director of the paralegal studies program, lives in her residence hall apartment with her husband, Jim, and her two kids, Anne and Helen. Living on campus was a way for her to stay connected to her daughters, who both live in D.C. and frequently visit their parents, she said. Her older daughter graduated from GW’s nursing program this past spring, and her younger daughter is considering law school at GW. Some may expect upperclassman residence halls to be covered with spilled food in the hallway and have loud music bursting out the doors from weekend parties, but Marsh said she hasn’t had any major complaints regarding her student neighbors.